Once the Santiago Calatrava designed World Trade Center Transportation Hub opens in early 2015, the Lower Manhattan Hudson & Manhattan Tubes will have had their lower Manhattan Terminal rebuilt three times plus the twelve years of two different incarnations of temporary PATH stations between 2003 and 2015. The southern tubes were built by the Hudson & Manhattan Railroad and opened on July 19, 1909. 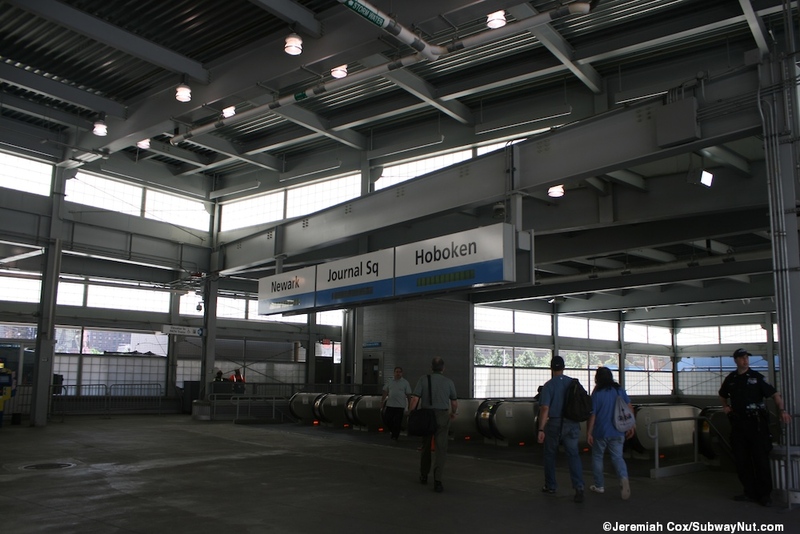 The station has always been designed to be a terminal and the H & M designed the distance between the two single track unidirectional tubes beneath the Hudson River to gradually become farther apart before arriving in Manhattan. 1909-1971: The original terminus called Hudson Terminal was closer to Church Street, slightly west of todays station site on a north-south axis with five tracks, and six platforms that could handle six cars between all of them. This meant trains could open there doors on both sides for more efficient entry and exit via staircases and ramps were the primary means of access. Above this terminal, the H & M Railroad built two 22 story office buildings that provided a decent source of income to the railroad. 1971-2001: In 1962 the Port Authority took over the H and M Tubes primarily as part of an agreement to acquire the decrypted bankrupt railroad (for New Jersey needs) and to build the World Trade Center (to serve New York's needs). 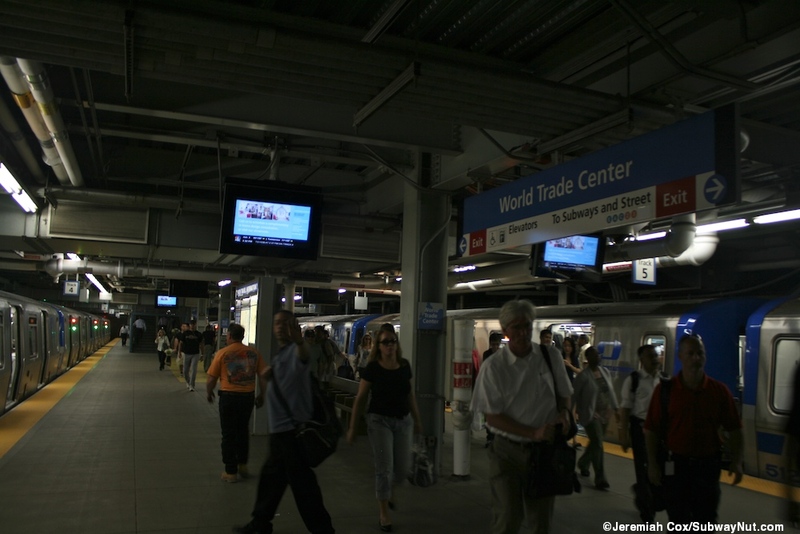 As part of building the World Trade Center, the Hudson Terminal buildings were demolished and a new PATH World Trade Center terminal was built west of the original station beneath the World Trade Center super block. It opened on July 6, 1971. This station had a similar layout of five tracks, but three, longer, ten car platforms. The curves to enter and exit the station were also made smoother by extending the train tracks around the foundation bathtub more gently before connecting to the original underwater tubes. 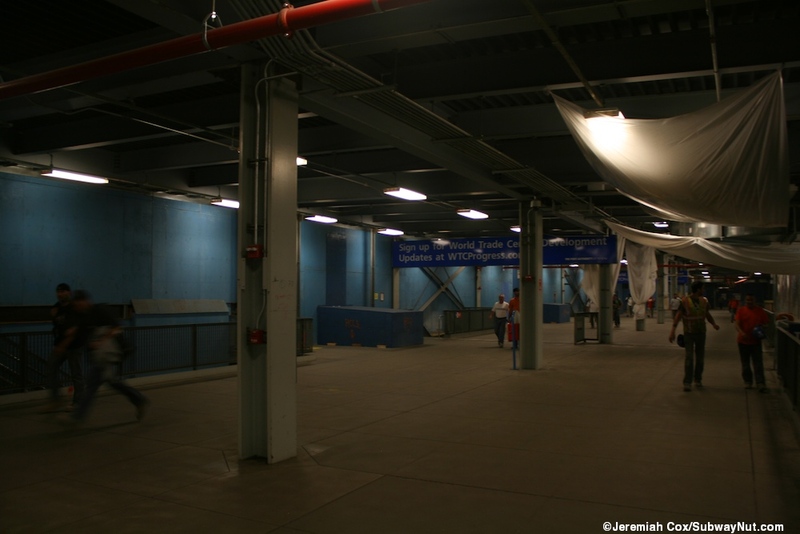 The station was accessed only through the underground shopping mall beneath the World Trade Center and had no real entrances to call its own. 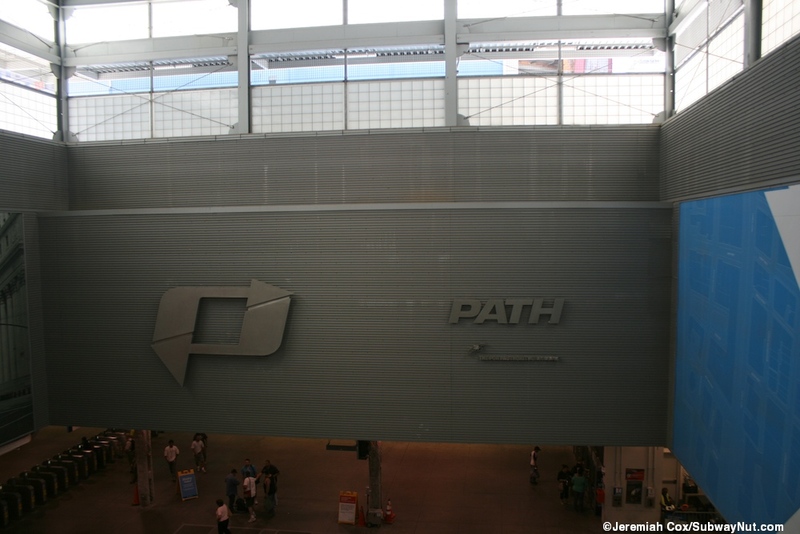 The layout of entry via the 'PATH hill' in the shopping center is in the same identical location as the PATH hill for the temporary PATH station in use between 2003 and 2008. 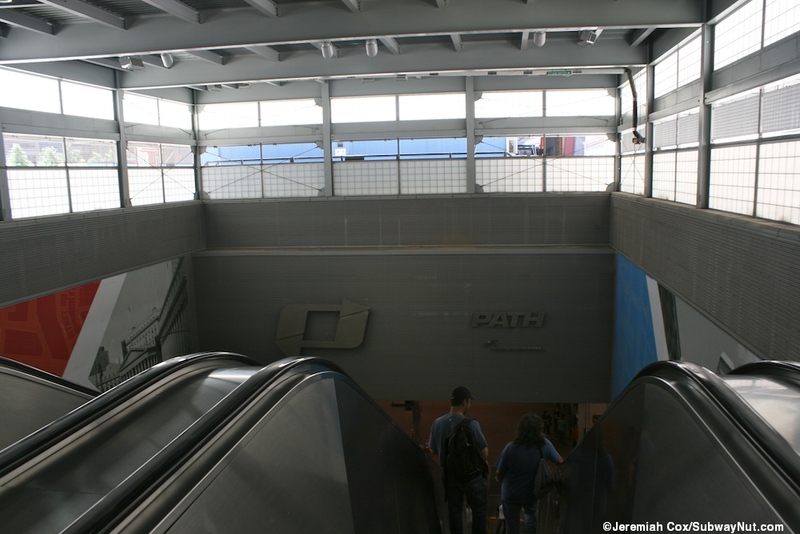 The platform layout and entrances were also the same as the 2003 to 2008 station. This station though had escalators in addition to staircases to connect passengers between the lower mezzanine and platforms. The station was quite dark with plenty of bare concrete and illuminated signs for the station name and train's destinations. 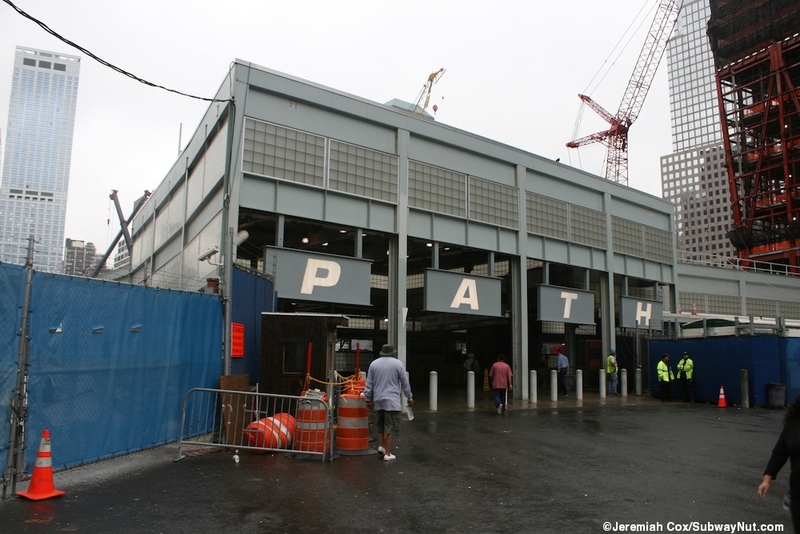 2003-2007: On September 11, 2001 the station was destroyed and with all the other tragedies. 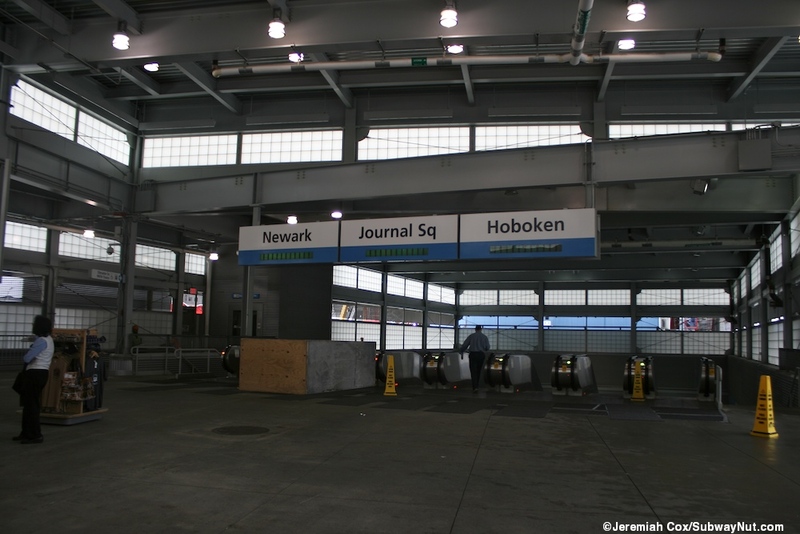 The tunnels flooded and PATH service was restricted to serving its uptown tunnel only between Newark and 33rd Street with the branch to Hoboken. Rebuilding the tunnels and tracks and just opening a temporary station took over two years. I got off a PATH Train on its reopening day, November 23, 2003 and this photo essay (not included in the photos in this section) is of the experience. 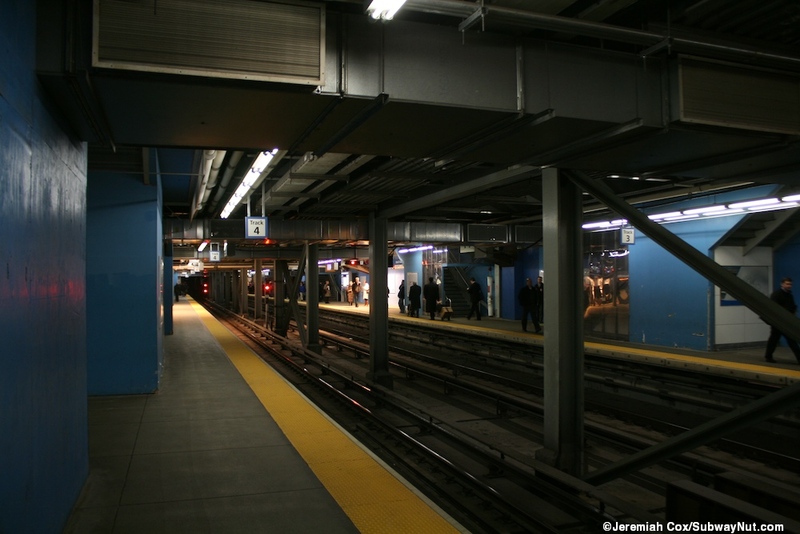 The tracks and platforms follow the same exact configuration as those of the 1971 World Trade Center Station along what was then open air bottom of the World Trade Center bathtub. Arriving and departing passengers were treated to impressive views of the construction activities going on as they enter and leave the station. 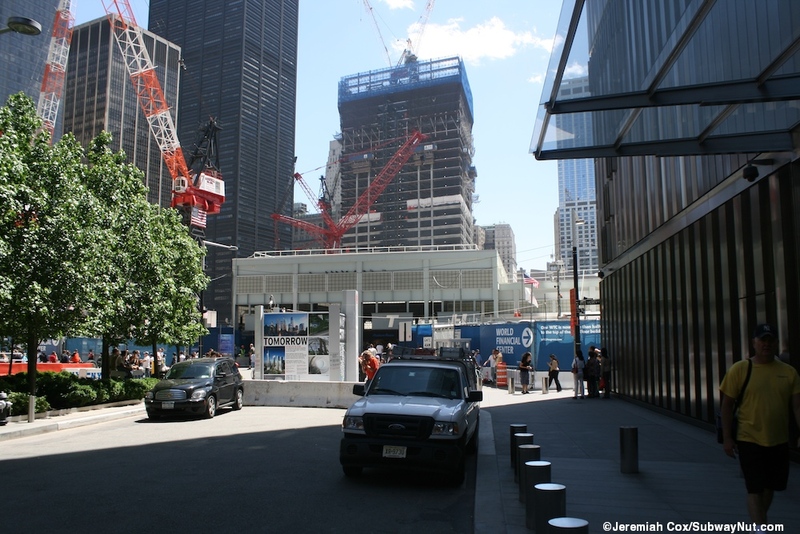 The entire station structure was exposed to the open air and became a huge tourist attraction as a way to get deeper views of the activities going on at the World Trade Center Site. Tourists Information booths and a StoryCorps booth for reflections on 9/11 are also located in the station. The station amenities and columns are all painted white. Mesh screens provided some obstacles to gawking at the construction workers rebuilding the WTC site. These screens are covered with quotes by New Yorkers about New York to show the cities resilience. 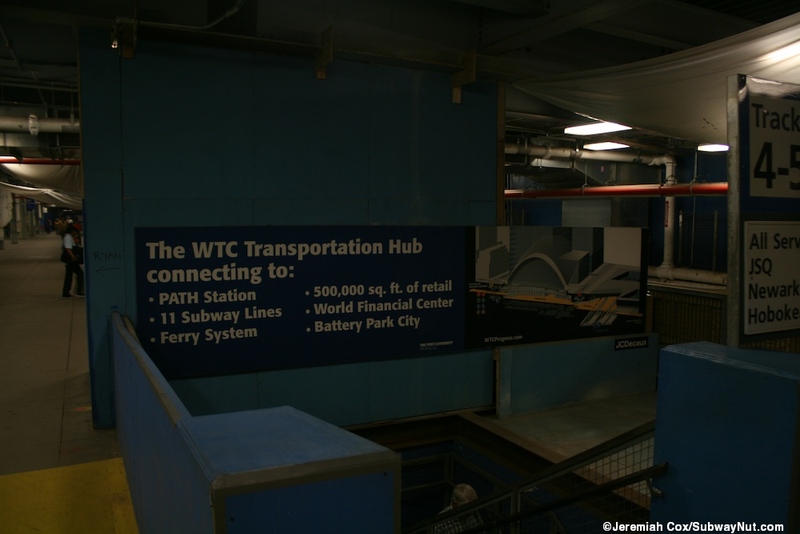 The rest of the walls of the station are decorated with historic imagery of lower Manhattan and graphics showing streets and skylines. The one other amenity (still partially on view in today's station) is a long ribbon of colorful mosaic tile called 'Saetta Iridescente' — Iridescent Thunderbolt and is on the lower mezzanine, directly above the platform. It is designed by Guilio Candussio, made by the Friuli Mosaic School and was a gift from Friuli Venezia Giula to the City of New York as a park of gratitude and solidarity. Friuli Experienced an earthquake in 1976. The tracks and station have slowly been surrounded by construction and new buildings. Today the station feels underground with no exposure to the bathtub or any sunlight anymore. Although it is definitely still in the open air, getting quite cold in winter. The train station itself has five tracks with three platforms, track 1 is a side platform on the east side of the station, while tracks 2 and 3, plus 4 and 5 respectively share island platforms. These platforms all have various staircases (that have been open and closed depending upon the needs for construction) up to a mezzanine directly above the platform. Elevators are at the southern end of the platforms and ADA compliancy has been kept throughout the construction process. 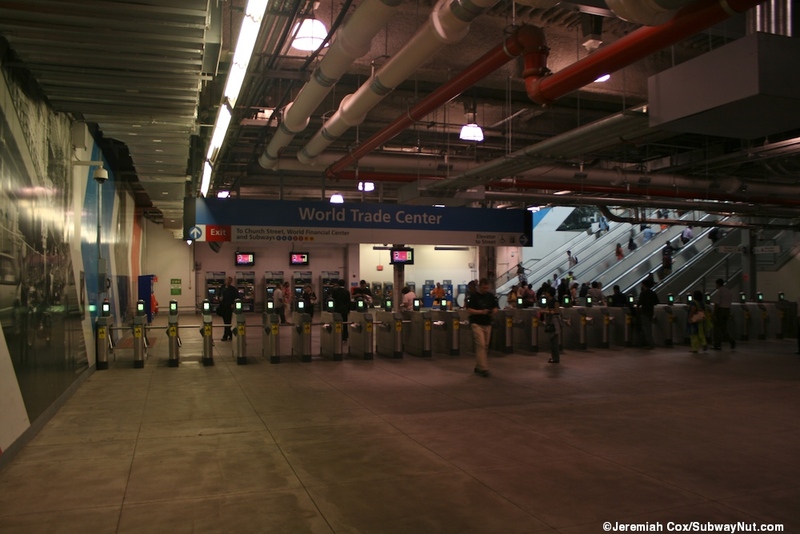 The 2003 reopening (and configuration of the new World Trade Center Station in 1971) saw two separate banks of turnstiles on the center of the mezzanine, meaning passengers get off trains at the front or rear of the platforms. 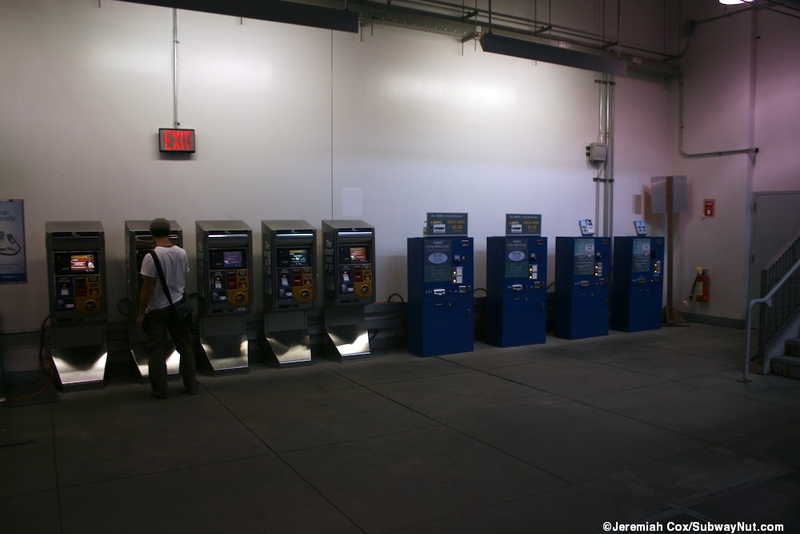 These turnstiles in 2003 were the first modern ones to be installed in PATH and the new turnstiles were gradually installed at other stations. 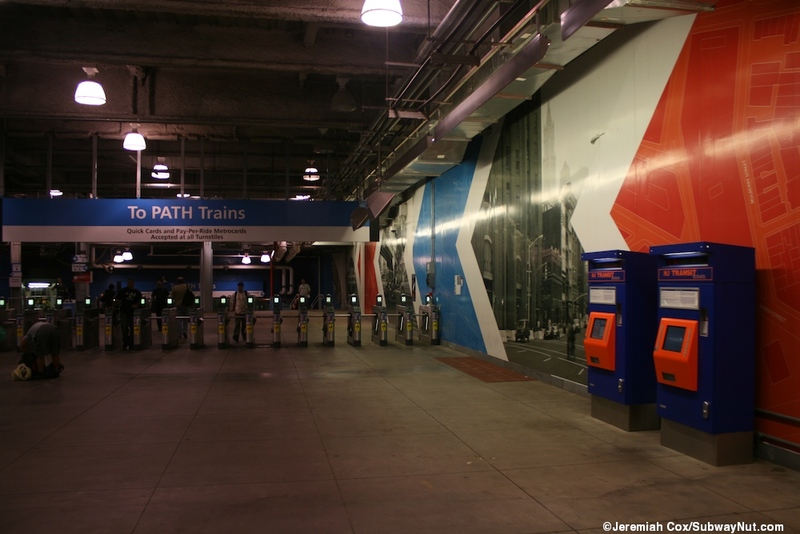 This was the first PATH station to accept MetroCards (as well as the old and now retired QuikCards). The MTA even issued a flyer telling passengers to enter their MetroCards in the machines like a QuikCard to take PATH instead of swiping. These separate banks of turnstiles both lead to a central mezzanine area. On this mezzanine is the only commercial establishment in the station, a Hudson News. From here it is up a few steps to the bottom of the 'PATH Hill.' This hill consists of eight escalators with two staircases for those who prefer the stairs. The hill leads up to the former level of the WTC concourse. From here there is a passageway to the north to the E train that takes passengers over through the 'survivors staircase.' This consists of original steps down and a ramp down to the doors into the World Trade Center E train Station (The PATH station is what makes the E train station wheelchair accessible). 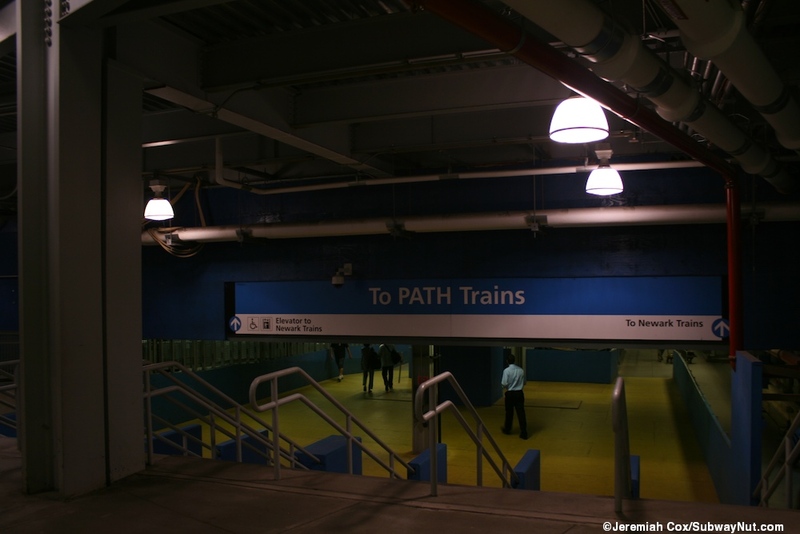 Another connecting passageway (also providing wheelchair accessibility) leads to the N,R, and W trains and the uptown platform at Cortlandt Street (downtown passengers must use the underpass). 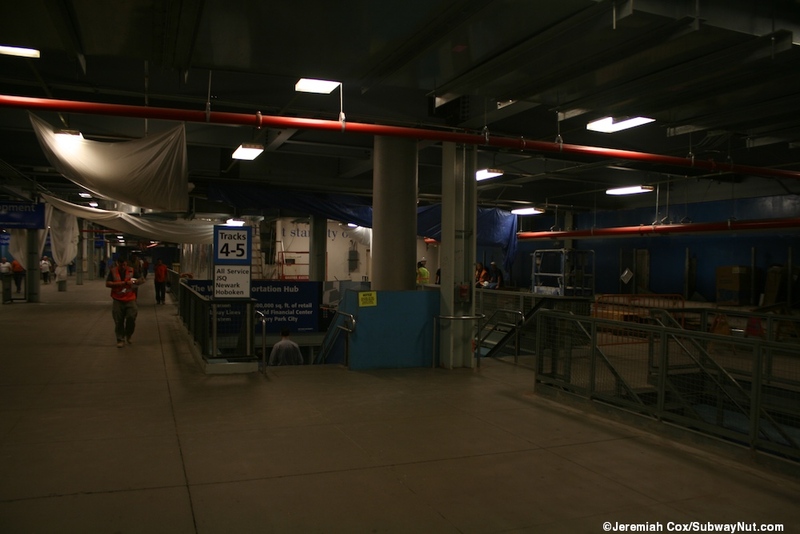 This entrance was closed along with the entire Cortlandt Street station on August 20, 2005 to allow construction of the Dey Street passageway for the Fulton Street Transit Center and other issues with World Trade Center Construction. The street exit from the station is up a super-wide staircase, with a stop at an intermediate landing to another super-wide staircase up to a pavilion plaza on west side of Church Street across from the intersection with Fulton Street. The entrance has a monumental steel suspended canopy to provide cover for entering PATH riders. On the front of this canopy hanging silver letters spell out World Trade Center PATH station. 2007-2008: The next major change for the station's rebuilding was a new entrance from Church Street to replace the original monumental one. This occurred on June 18th, 2007 and was a small temporary entrance 50 feet south of the original one with what looks like a canvas sail covering the staircases down to PATH (Here is a photo http://www.nycsubway.org/perl/show?80648, I didn't have a chance to photograph it). 2008-Present: The final temporary entrance (that the photos on this page cover) opened on April 1, 2008 with the sail entrance closing at 11:59pm on April 11, 2008 (this allowed passengers time to adjust to the new entrance). This entrance is located at the northern end of the World Trade Center site across from already rebuilt 7 World Trade Center along Vesey Street (just a sidewalk here), across from the triangle (no regular traffic allowed on any of the streets) formed at the southern ends of Greenwich Street and West Broadway. The nearest subway entrance is now a block away at Church Street and is a quite narrow streetstair that makes a very congested entrance (the MTA has put up signs for the entrance to be Exit Only during the AM rush hours, but this doesn't seem to be enforced). 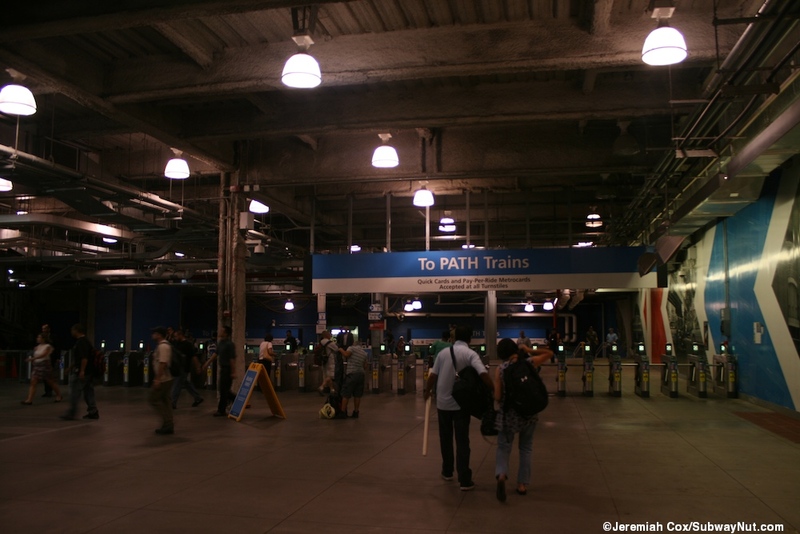 Passengers needed the A,C,2,3 are advised to walk two blocks north to Barclay Street where they will use the same turnstiles they would have used crowding the narrow entrance staircase. From street level the entrance is inside a small grey building with PATH suspended on individual grey beams. 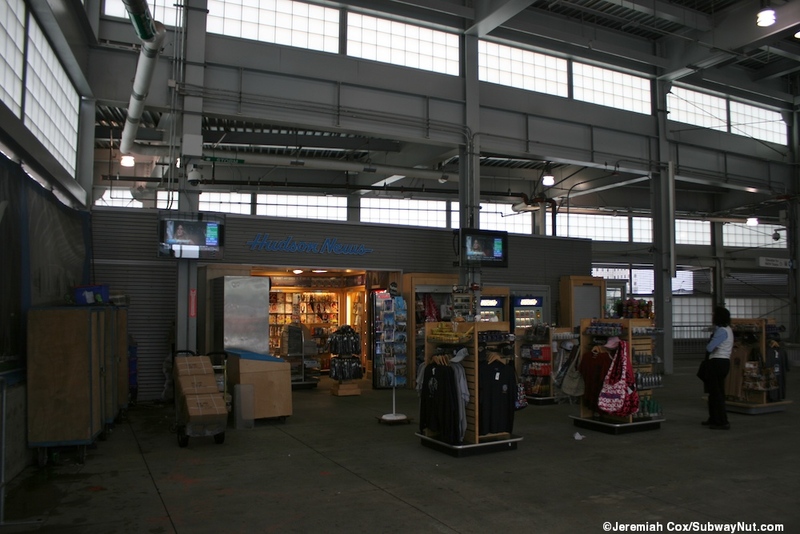 There is a security shack, a relocated Hudson News in the corner and passengers turn right to head down to the platforms via a new and temporary 'PATH Hill'. This hill has 8 escalators with two staircases along each side. It leads down to a simple fare control area. This area has MVMs and the long bank of turnstiles. 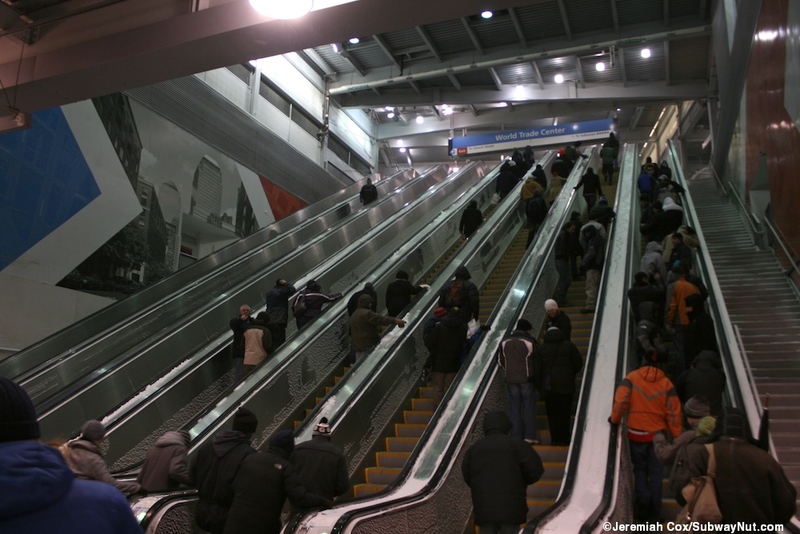 After tapping or dipping to enter the station passengers go down a short flight of stairs (or an awkwardly long ramp) and are at the northern end of the mezzanine that was rebuilt in 2003. 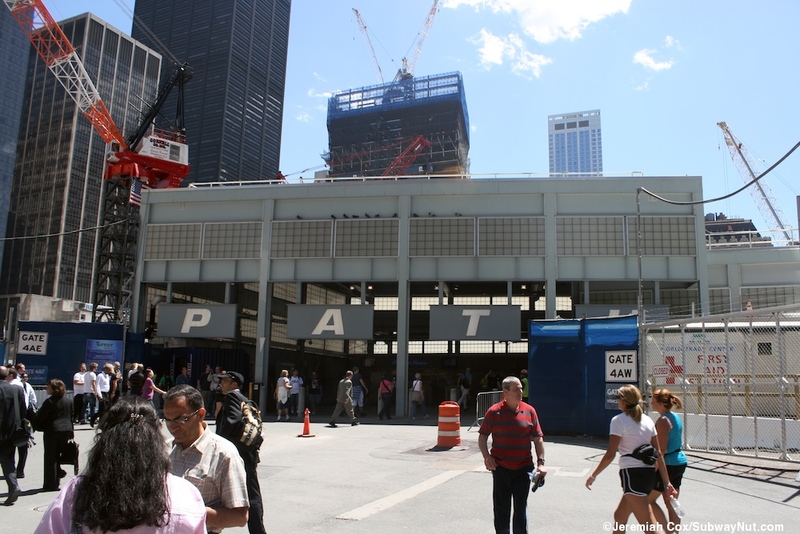 The station today is also used by construction workers, getting to and from there jobs rebuilding Ground Zero and at some point tracks 1 and 2 were temporarily closed. This has left just tracks 3, 4, and 5, and the platform for track 3 now has a blue plywood wall running down the middle of it. 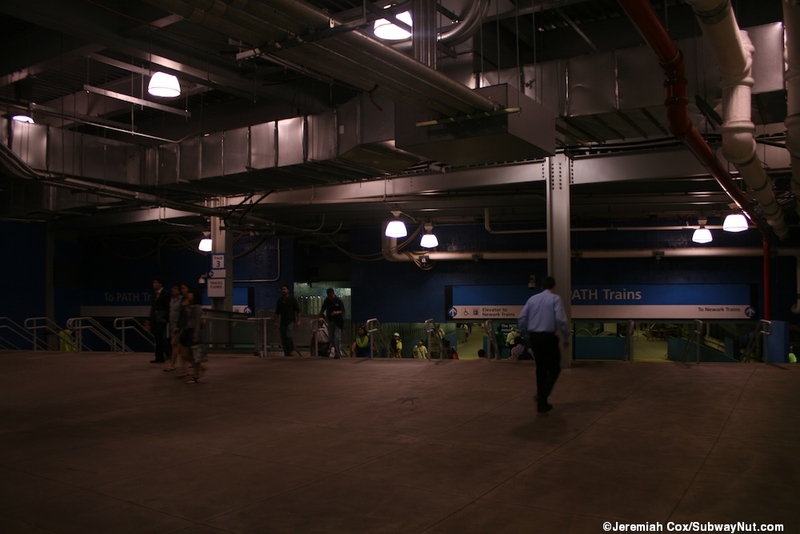 October 24, 2013: The new West Concourse opens, this concourse is the first part of the new permanent PATH station to open and will become a shopping Corridor. It is accessed by a corridor opposite the escalators to a set of doors into this corridor that continues under West Street to a bank of escalators into Brookfield Place.